One thing I love about designing custom jewelry is the challenge each client brings to me with all kinds of personal stories. Sometimes this means I have to play many different roles rather than just the jeweler. I’m truly amazed and grateful to all my clients for helping me realize my undiscovered potential through their interesting jobs. For this particular project, I was not only a jeweler but also an archaeologist and detective. A few months prior my client lost an heirloom carnelian ring and I was asked to recreate it with very limited information to begin with. All I had was an enhanced and enlarged image that only showed half of the ring. The rest was based on my clients’ memory, which can be tricky since memory can be subjective and abstract sometimes. And that is really the most challenging part of this task, I have to think like my client. The only clue I had for this ring project. This project reminds me of a recent discovery of a tail of a feathered dinosaur found perfectly preserved in amber from Myanmar. 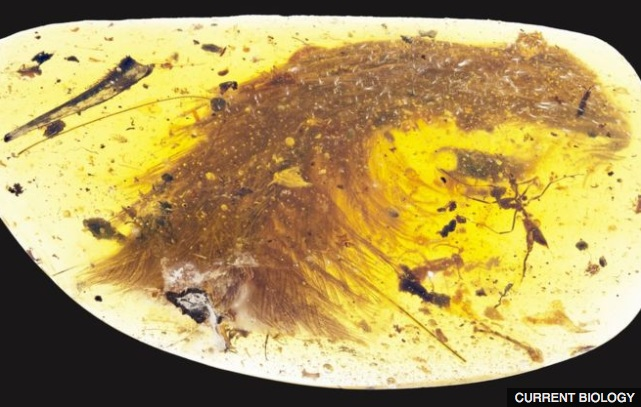 This is the first time scientists have found dinosaur material preserved in amber. Based on the fossil tail in the amber, with the help of paleontologists and the imagination of illustrators, they recreated a sketch of this feathered dinosaur that was about the size of a sparrow and lived 99 million years ago. Now, back to my story, with the clue I had in hand that I rebuilt the ring from the scratch including sourcing the perfect color carnelian, custom cutting the carnelians, and, of course, creating the ring itself. Fortunately, my clients were very understanding and patient, they guided me through every little step of the whole process to help me to create the ring as close to the original. They were so pleased with my services, that they decided to add one pair of custom earrings and a pendant with the same design aesthetics to make a set. The day before the delivery, I woke up from an anxiety dream. I was quite nervous, worrying about all the things that could go wrong when they receive the jewelry. What if she just absolutely hates it? 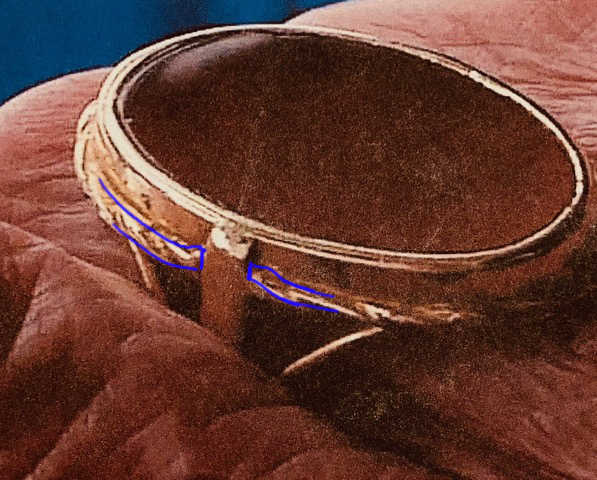 What if this is nothing close to her original ring? What if the color of the stone doesn’t look right to her in person? What if? What if?? What if !??? My worries immediately dissolved as soon as I saw my client’s big smile. And this is always the most rewarding part of my job: seeing my client’s happy, glowing face. It just means everything to me. Did I mention I slept like a baby that night? LOL. Does this story resonate with you? Let me help you to cherish your memories by restoring or redesigning an heirloom piece today! As a jeweler, I can’t help myself, the thing I care about the most is not her dress or the glamorous guest list, but Meghan Markle’s engagement ring! So, here is a little backstory on her engagement ring. As a touching tribute to Prince Harry’s mother, Princess Diana, the two smaller diamonds are from her personal collection. And that’s not the only way Prince Harry is keeping his mother’s memory alive: the large stone in the center has a hidden meaning, too. The diamond is originally from Botswana, which Harry often refers to as his “second home.” The couple recently vacationed in the African country for Meghan’s birthday. This heartwarming story just totally melted my heart, no wonder Prince Harry is one of the most popular royal and lucky Meghan! Do you like the idea how Prince Harry honors his mother by repurposing her jewelry for Meghan Markle’s engagement ring? Just in case you wondering, I provide custom jewelry service to help my clients honor the memories of their passed loved ones by giving their heirloom jewelry a new life such. 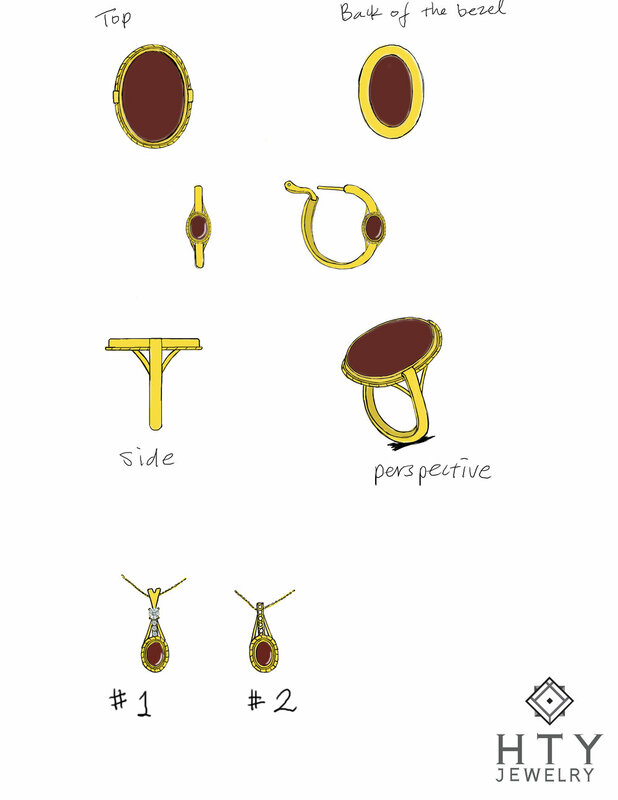 A redesign or restoration allows my clients to wear the jewelry and cherish the legacy in their everyday life. For example, the beautiful yellow topaz center stone of this ring is from my client’s great-grandmother’s necklace circi the 1920’s. She couldn’t wear the necklace before because the necklace mounting is not balanced. 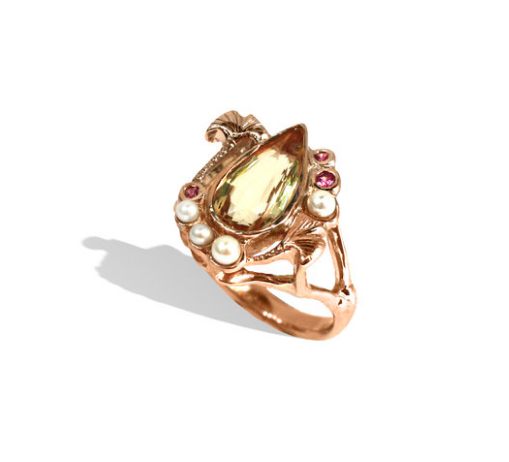 I removed one of the yellow topaz gems that is still in good condition, and created this Art Nouveau-inspired gingko leaf cocktail ring for her. 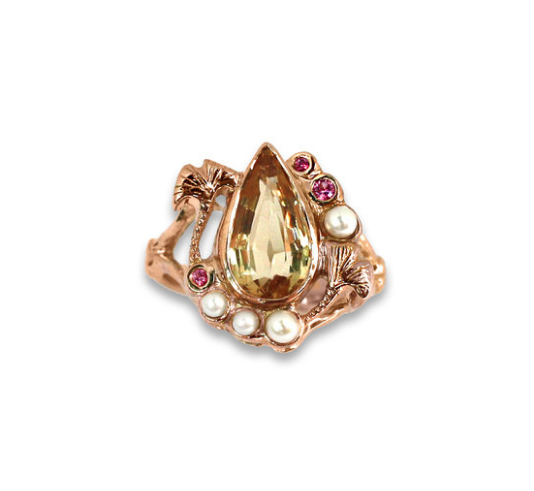 It features 18k rose gold, yellow topaz, pink sapphire, and pearls.